A wooden aircraft is not conductive and if a lightning hits the wood it will instantaneously ignite. How would you protect a wooden aircraft from this occurrence? By not flying through thunderstorms. For a small aircraft, the lightning is not the most hazardous part of a cumulonimbus (Cb) cloud system. Mature Cb clouds have huge updrafts underneath them, which can cause enough turbulence to upset most aircraft. Heavy rain and hail is also commonplace underneath Cb clouds. Even the rain can be heavy enough to damage wooden propellers and any components on your leading edge (such as the leading-edge slats found on the Tiger Moths I fly). Hail can put holes in your canvas, which are expensive to repair - if you manage to get the aircraft home at all. This turbulence and rain persists for a much longer period and across a wider area than the thunderstorm itself. For these reasons, the chief protection against thunderstorms is by training and procedure: student pilots are taught to avoid Cb clouds when they're visible, and to plan flights to avoid areas where Cb are forecast. Weather forecasts and reports specially call out Cb clouds to help with this, and ATIS messages often warn of "cumulonimbus cloud in the vicinity of the aerodrome". Protecting a wooden aircraft specifically against lightning is not hugely worthwhile, because it's unlikely to be able to stay in the vicinity of the Cb cloud for long enough to be at risk of a lightning strike. It just wooden happen. Additional physics-y information: trees attract lightning strikes because they are reasonably well conductive, especially the living tissue between the bark and the heartwood. Also because one end is well-grounded through its roots, which extend down to damp conductive soil. So they are natural lightning conductors. Wood once dried and turned into timber is not a good conductor, and a plane in flight is not grounded at one end. So it's much less attractive to lightning than a living tree. A metal plane is more likely to be struck than a wooden one because it is a near-perfect conductor and offers the lightning an much easier path than through air. However, for the same reason, a lightning strike doesn't often cause any damage to a metal plane. I'd expect that a wooden plane could be downed by a lightning strike, and lightning strikes are not always closely associated with cumulonimbus clouds. Look up "positive lightning" (a.k.a. "a bolt from the blue", literal meaning thereof). This is mercifully rare. Wikipedia reports that it has downed at least one glider. I'd also guess that a jet engine's high temperature exhaust creates something of an ionization trail behind it, equivalent to trailing some considerable length of wire behind the plane. A piston engine, much less so. Well, first off a wooden aircraft is not totally manufactured from wood; it does have metallic or otherwise conductive components throughout the airframe and is engineered with conductive pathways throughout the airframe for electrostatic dispersion and lightning protection as per the requirements of 14 CFR 23.1306, 25.1316, 27.1316, and 29.1316. It is undeniable that an airplane manufactured from wood or other materials that are good insulators would probably suffer considerably more damage to the structure from a direct lightning strike but they have been certified as to protect critical structure, fuel tanks and other components from massive electrostatic discharges. But there is a way: build them like a composite aircraft. There are very few wood airplanes left, for one thing. So the problem is solved by building mostly metal airplanes for past 70 years or so. As it happens, wood planes are still built in tiny numbers, and yes, they are vulnerable to lightning. But lightning by definition comes from thunderstorms and these must be avoided for other reasons anyway. The few handmade wooden planes that are registered these days are light planes that rarely fly in instrument conditions and so the chance of blundering into a storm cell is really low. It would be possible to build a protected wood plane. One could laminate a conductive screen on surfaces in the same manner as used on certified glass and other composite aircraft. However, I would guess that no one has ever done that. Wood airplanes do have steel control cables and rods, which can conduct a strike through one side of the aircraft to the other if the skin is penetrated, which is still destructive to the wood structure at that point. Burning or fire? Possibly if the strike is strong and penetrates the right places. That's why it's a good idea to install grounded static wicks in proper strategic trailing edge locations. There are modern and sleek kit planes out there today. Very sharp-looking, and pretty quick too. 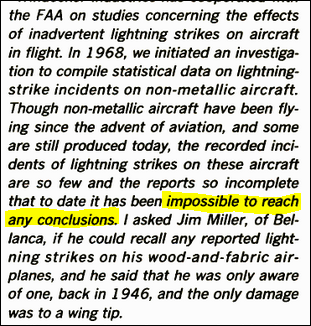 An article from Flying Magazine hints that lightning strikes do not affect wood-and-fabric planes. That there are almost no reported cases, and the only case they know of, resulted in a damage to a wing-tip. Source, go to page 6. It's worth mentioning that big composite (non-conductive) planes (e.g. 787) could suffer from lightnings if it weren't for special coatings, per Boeing. There are also conductive paints that cause the skin of the plane to carry the charge regardless of its composition. I would suspect that conductive paints that lead to static dischargers could also be used on wooden structures with cloth skins. How is an on ground lightning strike test conducted? What tests are done on aircraft wings for testing the effects of lightning? How are aircraft protected from lightning strikes by conductive skin? How well does a composite fuselage deal with lightning?  Aircraft lightning: What are the requirements for airworthiness? Do passengers notice if the aircraft is struck by lightning? How HF wire antennas on older aircraft are protected from lightning and static discharge?